Visualead is not just about helping you or your endeavors grow. It is also about connecting with the community. Aside from creating and generating your QR codes, the platform also allows you to share the QR code with the community that visits the website. Through this, other users can gain ideas from the codes you have generated and apply it for their own. 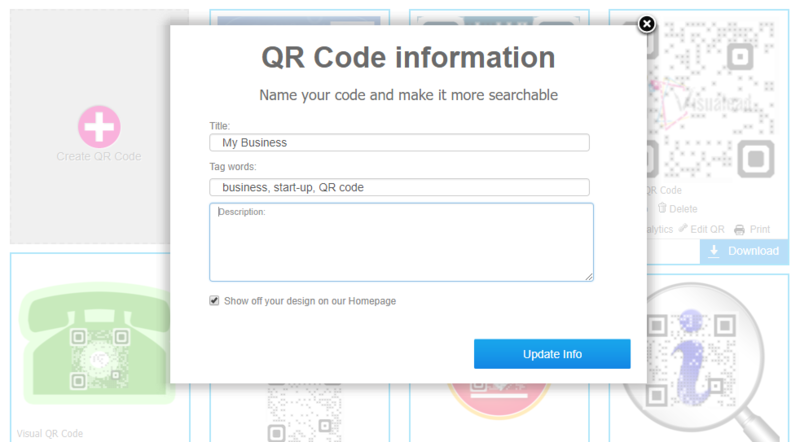 If you so desire, you can choose to allow your custom QR Code designs to be displayed on Visualead's homepage QR Code designs feed. Displaying your QR Code creation on Visualead's homepage will allow other users to view, comment and share your QR Code designs with others as well as help them to be inspired by great examples of QR Code designs. In order to choose to display your Visual QR Code on Visualead's homepage, go to your Dashboard, press "Info" on any QR Code and check or uncheck the "share my code on Visualead's homepage" checkbox.